This movie combines the seriousness of western with light humor to create a movie that nearly holds a niche by itself. Catherine "Cat" Ballou is an innocent school teacher returning home to the family ranch, where she finds that her father is slowly being driven off the ranch. She also encounters characters during her return home and on the family ranch that are quite unusual. Initially Catherine (Jane Fonda) plays a complete innocent. We meet Catherine on a train, where she encounters two men, one, Clay Boone (Michael Callan) is in handcuffs. The other is a drunken preacher named Jed (Dwayne Hickman), who carries a bible that has hidden attributes. Jed's often repeated line is "Ma'am, I apologize for my disgusting condition and I assure you I will not inflict myself on you any further." Soon Catherine finds herself in her delicates with Clay Boone next to her as he makes his escape from the sheriff and leaves the train, stealing a kiss from beautiful Catherine in the process. On her return home, Catherine quickly realizes that something is wrong. The cattle and horses are gone, and everything appears run down. Native American Jackson Two-Bears (Tom Nardini) is now working for her father. Jackson behaves in a most uncharacteristic fashion compared to the typical stereotype of Native Americans as usually portrayed in the 1960s. Jackson frequently makes comments on things white men usually think about Native Americans, with the point typically being that they are wrong. Soon Clay Boone and Jed also show up, and Catherine begs them all to protect her father from noseless killer Tim Strawn (Lee Marvin). In spite of Catherine's best efforts Strawn cold-bloodedly murders her father. Soon Catherine is being thrown off the family ranch. To help protect her father, Catherine wrote to gunfighter Kid Shelleen (Marvin, in a second role), sending him $50 as a retainer. When Shelleen shows up it turns out that he is a drunkard. However, having read a number of stories about the famous Kid Shelleen, Catherine retains faith in him. Soon Cat is encouraging the others to rob a train to get back at those who harmed her father. When the robbery nets far more than expected, Sir Harry Percival (Reginald Denny) sends Strawn after Cat, initially to encourage Cat to return the money. When Kid Shelleen realizes that Strawn is about, he sobers up quickly, and in an excellent series of scenes, transforms from a drunken slob into a genuine gunfighter. After Kid Shelleen and Strawn take care of their business, Cat goes to talk to Sir Harry Percival to get him to sign a confession that he ordered her father's death. When he refuses, the gun goes off and Cat ends up in jail, on a trip to the gallows, once more looking heart-breakingly beautiful and innocent. We have musical narrators throughout this movie, in the form of Professor Sam the Shade (Nat King Cole) and The Sunrise Kid (Stubby Kaye).While the pair are occasionally distracting, the songs are generally good, and are often used to introduce the upcoming scene. This appearance was Cole's last, as he passed away several months before the release of the film. There are several standout performances in this movie, including Jane Fonda's. However, the best performance is that of Lee Marvin in the dual roles. Lee Marvin was awarded the Oscar for Best Actor in a Leading Role in 1966 for his performance. He also won the British Academy of Film and Television Arts award for Best Foreign Actor, the Silver Berlin Bear at the International Berlin Film Festival, the Golden Globe for Best Motion Picture Actor in a Musical or Comedy, the Laurel Award for Male Comedy Performance, and the National Board of Review award for Best Actor. In total, this movie received 12 nominations for various awards and won 10 awards. If there had been such an award, the horse Marvin used near the end of the film should have received an award as well, as the horse appears to look as down and out as the horse's rider. This movie does not have the raw and riotous humor of "Blazing Saddles." The book on which this movie was based was a serious western. The humorous elements were added to change the tone of the movie. The humor is not as subtle as the humor in "Butch Cassidy and the Sundance Kid." However, there are numerous places where the script gets a smile, and there are several worthy of a laugh. This DVD contains a number of extras of varying value. 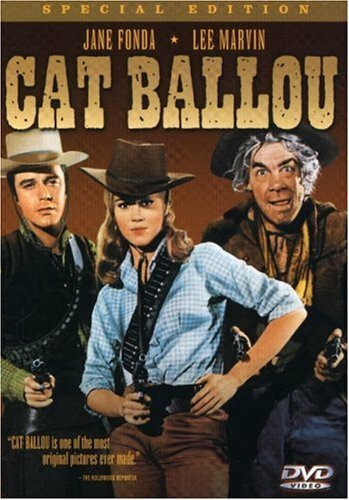 The "Legend of Cat Ballou" may be the best feature. The audio commentary is interesting, if you like hearing nostalgic memories of how a movie was made. One small detail I noticed. Kid Shelleen sang "Happy Birthday" at one point in the movie. The lyrics for "Happy Birthday" were not written until the next century, and each time I see that scene I must admit I am slightly distracted by the relatively glaring inaccuracy. There are other inaccuracies, but they are typically more subtle. I originally saw this movie in 1965 when it was released. I am surprised and pleased that the movie has aged well. While some recall Jane Fonda with distaste for her behavior a few years later, here Fonda is beautiful and perfect for this part. Lee Marvin reminds us all of why he was considered a great actor. If you consider yourself a fan of westerns, or Lee Marvin, and if you liked movies like "Butch Cassidy and the Sundance Kid," "Blazing Saddles," and "Two Mules for Sister Sara," I think you will enjoy this one as well. This movie was a terrible disappointment for me. It aspires to be some weird fusion of a traditional Western and a madcap spoof ¨¤ la A HARD DAY'S NIGHT and falls totally flat. The minstrel team of Nat King Cole and Stubby Kaye pop up at pivotal moments singing a series of forgettable ditties that grate on the nerves as the movie wears on. Lee Marvin spends most of the time balancing himself unsteadily on his horse and acting like the proverbial town drunk. For the most part, it's a charmless and embarrassingly mannered performance unworthy of a high school thespian. I have to wonder if Academy members were sucking on the same bottle as Marvin's bumbling character, Kid Shelleen, before handing him the Oscar for this dreadful piece of acting. Most of the supporting cast is also weak, or maybe it's just the quality of the material they're forced to work with that makes them seem so. Jane Fonda is really the only reason to watch this film. She plays the archetypal naive schoolmarm who falls in with the wrong crowd, but despite the role's limitations she delivers her lines with moxie and pluck. It's a joy simply to watch her gesticulate, so captivating are her charms. Too bad her talents and Marvin's are wasted in this tedious farce of a farce. A very funny offbeat western! This original script became a cult movie from its instantaneous release. Lee Marvin received the Academy Award and also the coveted Silver Bear as Best Actor. I'm sorry, but this movie misses the mark with me. Too much of this movie TRIES to be cute and funny and clever, and when the trying shows, it's a sure sign that it's not working. Some performances are spot-on. Almost all the bit parts are done beautifully. Tom Nardini as Jackson Two-Bears is outstanding and charming. But although Lee Marvin got an Oscar for his dual role as Kid Shelleen and Tim Strawn, I felt he was just too over-the-top to match the rest of the cast. Obviously the director didn't know how to rein him in...or chose not to. I really only knew Lee Marvin as a tough un-emotional army officer in movies like 'Dirty Dozen' and the 'Big Red One'. Here he plays a very drunk cowboy helping out a young woman (Fonda) who lost her father because the people in the town are after his farm. His role her is very funny and also really good and he deservedly got the oscar for this performance. Jane Fonda is very young here and plays a surprisingly comical role as a well educated woman who prefers to read dime-novels instead of Tennyson. Everything she does she even gets out of these novels. The entire movie is funny, dialogue is great and they make fun of a lot of typical western stuff. A special mention has to be made of Nat King Cole who, with someone else, acts as a kind of narrator of the story, but more like a bard/troubador who sings the story. The movie came out after he died unfortunately.